A post-apocalyptic literary epic in the tradition of The Handmaid's Tale, Divergent and Cloud Atlas, and a breakout book in North America for a writer of rare and unconventional talent. From Guardian First Book Award finalist Sandra Newman comes an ambitious and extraordinary novel of a future in which bands of children and teens survive on the detritus--physical and cultural--of a collapsed America. When her brother is struck down by Posies--a contagion that has killed everyone by their late teens for generations--fifteen-year-old Ice Cream Star pursues the rumour of a cure and sets out on a quest to save him, her tribe and what's left of their future. Along the way she faces broken hearts and family tragedy, mortal danger and all-out war--and much growing up for the girl who may have led herself and everyone she loves to their doom. This book took me quite awhile to get through, it was a difficult story to wrap my head around at certain points. 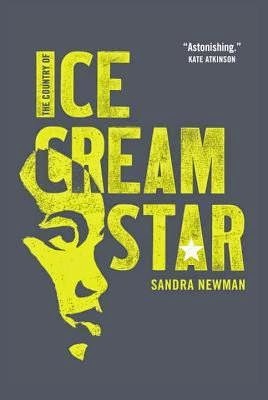 The most difficult part of this book was the writing style, the way Ice Cream Star speaks is hard to understand sometimes. It is interesting to see how Ice Cream Star tries to save her brother, she will do anything to save her family from this disease that has been killing everyone. When a rumour comes around that there is a cure for what is called "Posies", Ice Cream will do anything to find it. That is the one thing I truly loved about this book, for such a young girl she is a very determined person. It is interesting to see a girl like Ice Cream try to grow up in a post-apocalyptic world as is seen in this book. The world that Sandra Newman has created is one where children do not usually grow older than twenty, so it is a world full of young looking after the young, it definitely makes for some difficult conversations. I am having trouble describing everything that happened in this book, it is a long story where many things happen to Ice Cream as she gains perspective on the world and the people around her. There are a lot of secondary characters who are in and out of Ice Cream's life throughout the book, and each of them have a huge impact on her future plans. I have to say that this is a book I would like to go back and reread in the future because I believe I missed out on a lot of information the first time around since it took me so long to get through. This book is one of a kind and I see it being a popular book, readers will just have to have the time to invest in reading this. This sounds so interesting and I am always interested in a book that you can really sink your teeth into.